Myself and Scott have a few holidays on our bucket list - some as a family with the three girls and some on our own as a couple. I think you should always find the time to get away as a couple and spend quality time together . One of our dream holidays still on our bucket list as a twosome is Hawaii. Ever since I watched the movie 50 first dates, I am sure you have all seen it , and if you haven’t then where have you been? It is one of my favourite movies of all time and I have watched it probably a hundred times. It is set in Hawaii and Hawaii is exactly how I picture it in this movie. Volcanoes! - now I know it is probably a cliche but Hawaii is known for its volcanoes and I would absolutely love to explore and get to see a volcano in real life (not to close though!) ,and obviously take some gorgeous photos for my blog.l and learn about them.The volcano National Park looks the best place to start to soak in some information and facts , the visitors centre has historical island information as well as eruption videos to watch - which I know is definitely up Scott’s street, he loves all that type of stuff .There are also so many different walks you can do that will actually take you up to the volcano to watch them in action,which I find absolutely amazing, and also slightly scary! Food! - We are complete foodies and are always up for trying new foods and exploring different flavours. Poi, is a traditional dish in Hawaii. It is Kalo mushed up like a potato consistency and tastes a little bit like a sweet potato apparently. It is purple in colour and the locals like to add a little bit of sugar to it,yum!The Acai bowl in Hawaii is suppose to taste amazing!. Even though you can find these all over the world and I’ve actually tried to make one at home. This dish is one of their popular snacks to have . Hike the stairway to heaven- now I know this hike is actually illegal now and I hope they re open it , but I do actually know a few people that have still hiked it. I think most people do,but it is very dangerous to do so!. The stairway to heaven opened in 1987 and has actually been closed now for over 30 years now. 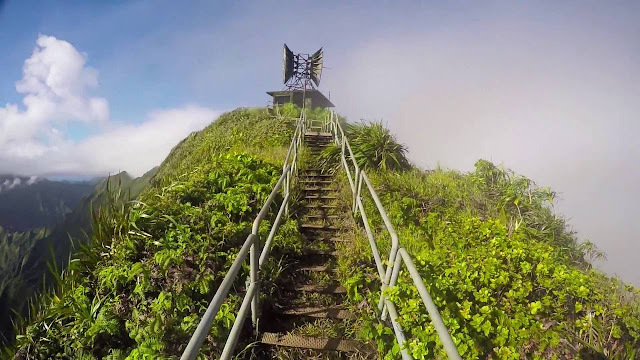 It has 3.922 steps and takes roughly 3 hours to get to to the most incredible view. I can’t imagine Scott on this trail but I would absolutely love to do this. I am very passionate about nature and this trail looks incredible . Swim with dolphins - this has actually been on mine and our eldest daughter Kadiann’s bucket list for a few years . She is now 14 and a confident swimmer so I feel she would be ready now . I know you can actually swim with sharks in Hawaii! I don’t think I am that brave to be honest.Swimming with dolphins is a little scary for me , never mind sharks! I’ll leave that experience up to Scott Ha! Walk through the bambo forest - I have heard so much about Maui’s bambo forest , and the photographs I have seen look incredible!. It is roughly a mile walk on the trail to get there but it is well worth it from what I have read, and you will know once you get there as you will be ompletely surrounded by bamboo. Some say the wind brushing against the bamboo gives off a chime , almost like music . There is so much to experience before you get to the forest - the infinity pool and the 200ft Makahicku fall are just a few beautiful views you come across on your travels. Yoga- if you have been a regular reader and a follower of mine then you will know we follow a spiritual and nature based life. Mediation and yoga are part of our daily routine and I would recommend it to anyone. Hawaii encourages yoga for all ages and they say it helps the mind , body and the soul, which I 100% agree with!. Traditional yoga was done by the whole family in Hawaii : kids for developing balance and agility, teenagers to help with hormone balance and changes in their bodies , adults to cure diseases and the elderly for relaxation. Yoga on the beach whilst the sunsets sounds so therapeutic and I would definitely do this probably every night on our stay . I would love to visit Hawaii too, it must be on quite a few peoples lists! I have never been to Hawaii and reading your post makes me wanna go too. I guess I am adding this on my bucket list. Hopefully, I get to visit it this year if time and my money permits me to. So many beautiful places to visit! I have heard a lot of good things about a Hawaii. I think it makes a perfect couple getaway destination. I've never been to Hawaii but I wouldn't say no. Sounds beautiful! Ooh sounds lovely! Definitely a bucket list destination. I think I'd love the mix of adventure and chilled out atmosphere in Hawaii!